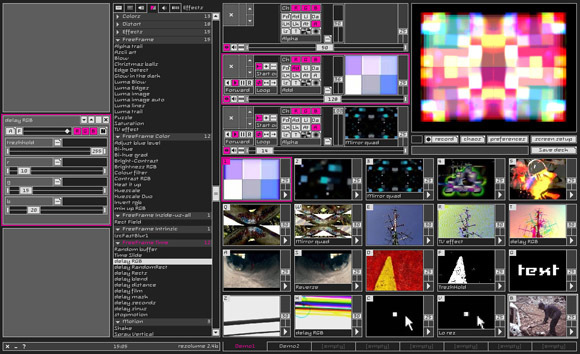 Resolume have just released Beta 2.4 for public consumption. My favourite addition so far is BPM sync for clips and effects, but this version also includes DMX control for lighting equipment, opening up a whole new level of possibility for staging events. With the BPM clock in Resolume it is very easy so synchronise video clips to the tempo (Beats Per Minute) of the music. By setting the the video clips in BPM mode the speed of the clips is automatically adjusted to fit in any number of beats. The BPM clock can be set manually or can be linked to an external Midi clock. With this function your visuals are so easily synchronised to the beat of the music! The BPM clock can also be used to drive effect parameters and to have them play synchronised to the music. DMX can be used to control Resolume but also to send DMX signals from flash movies playing in Resolume. This enables you to integrate your visuals and video with lights, strobes, lasers, moving heads, LED pannels and any other device that is DMX compatible. DMX signals can be send via Artnet over a computer network or via USB with the Enttec DMX USB Pro Interface. We took some extra time to totally dissect the Resolume engine and Edwin was able to improve the playback speed dramatically, with one layer playback framerates can be up to 80% faster and running multiple layers can be up to 10-20% faster. So if you were thinking about switching from 320×240 to 640×480 now is the time to try it out. I’ve been Beta testing 2.4 for a couple of months now so it’s great to finally be able to share this publicly. I was running it for the recent Elements:5 party here in Brisbane, and it was stable for my 7ish hour set. BPM is a great addition, and it will be interesting to see what the addition of DMX brings. Resolume 2.4 Public Beta is available for download now. The online manual is available here, and for those who are already familiar with the software here is an explanation of the new BPM functions.